Hey everyone! I hope you all had a lovely weekend, I got back from Edinburgh late last night after walking miles and miles all weekend so I'm exhausted, but I had a really great time. I'll be showing you my 'nails on holiday' in my usual format soon once I've decided which photos to use because I ended up taking loads! 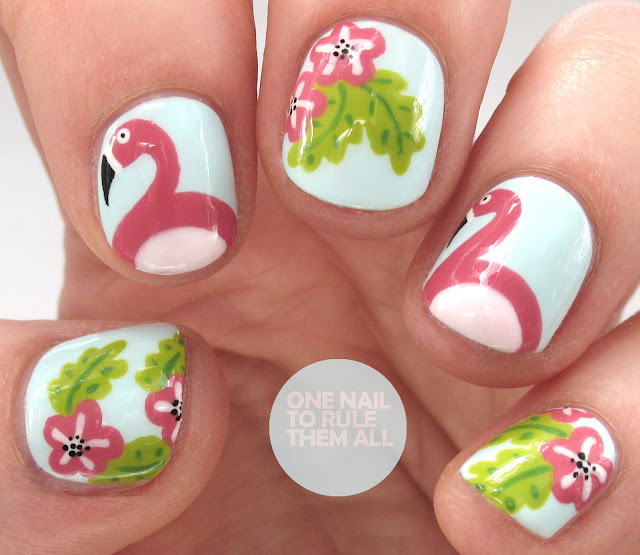 Today I have a brand new tutorial over on Divine Caroline for you, showing you how to create these cute floral flamingo nails. I was originally inspired by this nail art by Tipped Off Nails, but I wanted to show you how to create something similar at home. I was searching for some floral flamingo inspiration when I stumbled across her manicure and knew I had to create it. If you want to learn how to create these you can see the full tutorial here. What do you think? Let me know in the comments! And don't forget to check out the tutorial.